The purpose of a Jew is to be a priest unto the nations, or in the words of Rabbi Nachman to be “just like Rabbi Nachman really” but through his merit only. Abraham actually failed compared to Lot, and people are far from realizing this. Abraham was very successful until he reached the test of Sodom and Gomorra. Not only did he fail to save these cities, but he had to move away (maybe even his neighbors did so). The King of the Canaanites of Beer Sheva even comes out as “holier” then Abraham. How so did Lot succeed where Abraham didn’t? Lot was able to save Zohar in bargaining with G-d, where Abraham had failed. In the middle of the land of Israel turned into hell, a piece of holy land remained. A parallel to this is Moses who is able to save the people of Israel, since he himself remained the only faithful man to Josef, he used this as leverage in bargaining with G-d to save the people of Israel. Israel is a misnomer by the way because only one faithful to Josef is Israel …”these were the generations of Jacob: JOSEF”. Moses who grew up an Egyptian was the only Israeli around. The holiest and most vital work for humanity is the Hafatsa of Rabbi Israel Ber Odesser who is Rabbi Nachman come back to earth in the flesh and is precisely the 12th Imam the followers of Ali know about. He left humanity one task which will unite us in joy, love and peace. That task is bringing the bones of Rabbi Nachman to Mt Zion, Jerusalem. “because from Zion the Torah will come forth and the word of G-d from Jerusalem” “Nachamo Nachamo MY NATION…(ends with) not a man will be absent”. 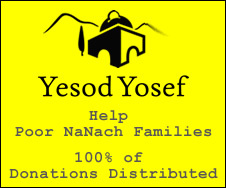 Anyone really serious about living should give up everything and come to the village of Ebay Ha Nachal which is named after the book of Rabbi Nachman (the greatest of them all). This "move" is like the tenth test of Abraham, but more is required of us to be JUST LIKE Rabbi Nachman.